In light of this chapter’s emphasis on placing theory into practice, it is interesting to consider Douglas Eyman’s rhetorical design choices and the effects of these choices on the reader/viewer. The digital version of the book only includes alphabetic text—black typeface on a white background. As Eyman explained in the introduction, “I originally conceived of this project as a traditional (print) text, but through the good fortune of publication by the University of Michigan Press, it has evolved into a dual-natured work, available in both print and digital formats. While a born-digital version of this project would be quite interesting and more interactive, the outcome would be radically different—much of the review of the literature and explication of definitions, theories, and methods presented here simply works better in the traditional academic discursive form” (pp. 9–10). 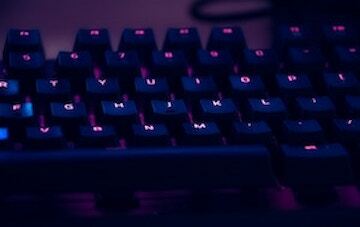 Significantly, despite digital and multimodal affordances and capacities, traditional, linguistic writing continues to offer greater ease of exposition, precision of expression, and development of argument than other modes. While I agree that the book’s argument necessitates explications in prose, considering the connections between digital rhetorics and multimodal composition, I would have liked to see (or experience in alternate modes) more multimedia elements in the text, reflecting the interplay between content and format. Digital composing processes are inherently multimodal, as explored in the recent Kairos webtext Multimodal Composing, Sketchnotes, and Idea Generation by Kendra L. Andrews and illustrated by T. Mark Bentley (2018), which “illustrates how multimodal strategies such as sketchnotes can enhance idea generation and learning and provide classroom strategies for multimodal composition.” Especially considering Eyman’s emphasis on conceptualizing digital rhetoric as both a method of analysis and production, integrating multiple modes including the visual, aural, and spatial could further enhance the book’s arguments. For instance, spatial representations of the current concepts or historical evolution of the field, visual examples of data analysis methodologies, podcasts relating the opening literacy narrative, or videos explaining the background or exigence of the book could invite new forms of readerly understanding, engagement, and understanding of the text. Expanding upon the modes of expression could additionally offer increased accessibility for users with a range of (dis)abilities. In the introduction, Eyman wrote, “In a future edition of the digital text, I hope to implement a “remix engine”—a system that will allow readers to pull elements from the book, edit them, rearrange them, add additional content, and share the results with others” (pp. 10–11). As I became interested in creating and analyzing a meta-level visual representation of the text, I copied and pasted each chapter into a single document, which I uploaded onto the word cloud generator WordClouds.com. 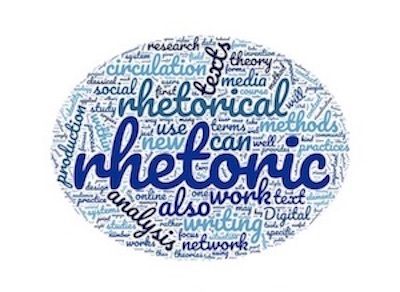 In the word cloud, the words "rhetoric" and "rhetorical" are the most prominent, central, and visible, while words such as "texts," "analysis," "writing," "work," and "circulation" surround the rhetoric/al. Interestingly, the word "digital" is smaller, occupying a margin. One might assume a nearly equal distribution of the words "digital" and "rhetoric/al," yet the predominance of the rhetorical over the digital raises intriguing implications: is the digital secondary to the rhetorical in signifying merely the spaces in which the rhetorical is enacted? Is rhetoric the content and digital the form? To what extent does the continued prominence of linguistic, written texts over other modalities of expression intertwine with the prominence of the rhetorical over the digital? Directly above and below "rhetoric" are the surprisingly prominent words "can," which invites potentiality, and "also," which gestures toward connectivity. Of the smaller words surrounding the rhetoric/al, interesting patterns emerge. For instance, "analysis" appears to be slightly larger than "production" and "theory" appears to be slightly larger than "practice," which leads to the question: to what extent does — or ought — Eyman or the field privilege theory/analysis as opposed to production/practice, or are the theoretical and applied meant to exist in balance? Intriguingly, "work" is larger than "network," which makes one wonder in what ways work encapsulates a range of analog and digital concerns, thus serving as a broader term than network? Such are a few of the questions with which the text leaves us as digital rhetorics transform our practices and praxes; the answers have yet to unfold in time and space. Continue to the remix video.